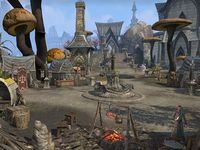 Eyevea Merchants' Circle is a collection of stalls in the Merchant District of Eyevea. A blacksmithing station found near the forge is available for crafting while a cooking fire beside the grocer's stall is inoperable. A daedroth followed by a banekin, both non-hostile, can be seen running in and out of the marketplace. The Archer's Paradox — A woodworker stall owned by Valaunce Cariveau. By The Three, Buy From Me — A stall run by the merchant Bivala Aralen. Egg-Siblings' Magical Goods — A magical goods stall housing a magus and a mystic. Eyevea's Bright Smithy — A forge operated by Lugolg gro-Goldog. Lustrous Leatherwear by Odvar — A leatherworker stall owned by Odvar. A Panoply of Blades — A melee weapons stall run by Areshu. The Right Stuff To Cook — A stall operated by the grocer Donallir. The Script & Stein — A brewer stall owned by Romehdi. Vilgis' Invulnerable Vestments — A heavy armor stall run by Vilgis.